Peugeot 206 Blaupunkt 5 CD Changer complete with glove box mounting bracket and cable. Perfect working order when removed from car. May require coding to your vehicle. Please see my other listing for head unit to match from same car. This item was removed from a functioning stereo and was tested before removal. GENUINE PEUGEOT 206 307 1007 Blaupunkt IDC-A09 CD Changer 656476 96637229XT and headunit. Condition is amazing. This was in my 206 GTI 180. Dispatched with Royal Mail 2nd Class. VW RCD 500 BVX. - FM/AM Radio Tuner - RDS. VW Golf Mk5. Refurbished Radio / CD Changer. Our staff have been Manufacturer Trained and Certified by Blaupunkt in Service and Repair techniques. In this instance we would suggest that you consult your Volkswagen Main Dealer for further advice regarding compatability. F refers to FRONT, R refers to REAR. Northern Ireland . img ref H-2645 BOX 5. ------------North West. Blaupunkt Compact Disc Changer - Good condition! Blaupunkt 10 disc CD changer. GENUINE PEUGEOT 206 (T1A)(T1B)(T1C)(T1F) 307 (T5F) 1007 (A08) Blaupunkt IDC-A09 CD Changer 656476 96637229XT 6564RK. RD3 VDO/Blaupunkt. RD3 Clarion : PU1633A/PU1646A/PU2184A/PU2294A/PU2380B / PU2473A. The RD3 was radio- about 2004 built up, then got the RD4. The CD changer function must be switched off. The function of the CD-changer you can unlock your car dealer if necessary. Blaupunkt 5 disc CD Changer. Peugeot 207 2006-2009. In good order. Does have minor age related marks. Out of hours collections can be also arranged by prior notice. VW PASSAT B6 GOLF MK6 CADDY. The head unit will need coding to your receiver vehicle. PART NUMBER Removed from a RIGHT-HAND DRIVE vehicle. NUMBER OF DOORS Unit 1 Clapgate. Tested and quality checked pre-removal. If so, this is what you need. MERCEDES W210 E Class Blaupunkt CDC-A072 CD Changer . Tested And Fully Working . Cd changer shown comes in good condition tested and fully working . Please look at all pictures so you know what your buying. Tracked post on this item. 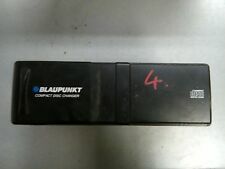 blaupunkt Cd ChangerMgr part no xqe00410 Blaupunkt part no 7 607 700 012. Condition is New. Dispatched with Royal Mail 2nd Class. For sale Blaupunkt / Audi navigation 3 - boot mounted CD unit. Removed from 1999 Audi S4 b5. Maserati Blaupunkt Multi Changer. Condition is Used. Came with the car but i have an aftermarket system in place now so never personally used this myself and do not need it. Came with my Maserati Quattroporte 2006. Any questions, don’t hesitate to get in touch. Thank you. Blaupunkt CDC-A072 10 CD Changer. Removed from a VW Golf, but will fit a variety of vehicles such as. First in car blaupunkt single cd cartridge.fully working. PART NUMBER 96365979XT. WE WOULD LIKE TO SORT OUT ANY PROBLEMS QUICKLY. IF THERE ARE PART NUMBERS IN THE ADVERT, THEY'RE THERE FOR A REASON. THIS MUST BE CHECKED PHYSICALLY AGAINST THE PART YOU ARE REPLACING. Genuine Blaupunkt radio CD / MP user's manual. Genuine Blaupunkt radio Tape / CD / user's manual. 2005 PEUGEOT 307 1.6 HDi 90 S 5DR. BLAUPUNKT 5 DISC CD CHANGER. Blaupunkt CDC01 CDC-01 12 Disc CD Changer BRAND NEW OLD SCHOOL RARE! Blaupunkt CDC01 CDC-01 12 Disc CD Changer BRAND NEW OLD SCHOOL RARE! Blaupunkt CDC-01 12 Disc CD Changer Manufactured in Japan in 1990. BRAND NEW IN BOX. Item is exactly as in the pictures, 100% original photos! BLAUPUNKT 5 DISC CD CHANGER UNIT. IF THERE ARE PART NUMBERS IN THE ADVERT, THEY'RE THERE FOR A REASON. THIS MUST BE CHECKED PHYSICALLY AGAINST THE PART YOU ARE REPLACING. IF IT DOES NOT MATCH THEN IT IS MORE THAN LIKELY WILL NOT WORK ON YOUR CAR. VAUXHALL CDC 6 DISC CD CARTRIDGE. AUDI A3 Sportback (8PA) 2.0 TDI quattro. - Modell/Typ A3 SPORTBACK (8PA) 2.0 TDI QUATTRO. There can be from the manufacturers production changes in the current models. Construction period The original vehicle data. WILL FIT THE FOLLOWING BMW E46 3 SERIES MODELS FROM 99-2001 1999 - 2001 BMW 325xi. 1999 - 2001 BMW 323i. 1999 - 2001 BMW 330i. 1999 - 2001 BMW 328i. 1999 - 2001 BMW 325i. ITEM WAS REMOVED FROM A 2001 BMW 325I. IT IS BEEN REMOVED FROM PEUGEOT 407 3.0 COUPE 2008 YEAR RHD. ONCE AN ITEM IS RECEIVED BACK IT WILL BE QUALITY TESTED ON OUR BENCHES AND CHECKED FOR A MATCH WITH THE ONE SOLD. (MAKE SURE THE PART NUMBER MATCHES THE ONE YOU NEED). Radio car radio CD 30 MP3 Entheiratet 13188461 OPEL ZAFIRA B (A05) 1.9 CDTI. Car radio CD 30 MP3 Entheiratet. OPEL ZAFIRA B (A05) 1.9 CDTI. - Modell/Typ ZAFIRA B (A05) 1.9 CDTI. Produkttyp Radio. Aggregates are generally sold without mounting parts. Maserati 4200GT Coupe/Spyder. Taken from a 2005 year Maserati Coupe. Maserati 3200GT. Radio CD MP3 car stereo chorus 8P0035152C AUDI A3 CABRIOLET (8P7) 1.6. AUDI A3 CABRIOLET (8P7) 1.6. - Modell/Typ A3 CABRIOLET (8P7) 1,6. CD MP3 car stereo chorus. Produkttyp Radio. Aggregates are generally sold without mounting parts. Parts manufacturer Blaupunkt. The part number in the table above must be identical with the number of your part, otherwise the part will not work properly. M.Bednarczyk, K.Kruczek. SWIFT: INGBPLPW. 30 1050 1070 1000 0022 1597 3690. VW JETTA III (1 K 2) 1.9 TDI. There can be from the manufacturers production changes in the current models. - Modell/Typ JETTA III (1K2) 1.9 TDI. Construction period The original vehicle data Aggregates are generally sold without mounting parts.